Update, July 9: Darksiders III will be out this November, and the publisher has provided a new trailer and collector’s edition info alongside the confirmation. 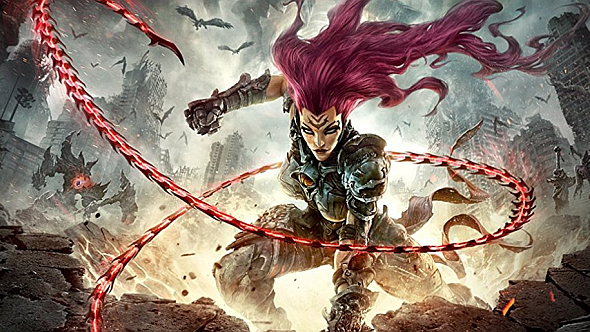 The release date for Darksiders III was leaked thanks to the Microsoft store page over the weekend, and today THQ Nordic has confirmed that news is accurate. Darksiders III will launch November 27 on PC, the same day as its console counterparts on PlayStation 4 and Xbox One. You’ll be able to pick up the game for the usual price of $59.99 / £44.99 / €59.99, and you can pre-order the deluxe edition at a discounted price of $59.99 / £52.49 / €69.99, giving you access to two bits of as-yet-mysterious “gameplay DLC” in addition to a soundtrack. All pre-orders also includes a new skin for our protagonist, Fury. If you’re all about hacking, slashing, and levelling up, check out the best RPGs on PC. If you need to spend even more money on your Darksiders obsession, you can pick up a collector’s edition for $149.99 USD, with an artbook and an 11-inch statue of Fury. For the low, low price of $399.99, you can get the Apocalypse edition, which adds statues of War, Death, and Vulgrim alongside the Fury figure, as well as a wall scroll and an exclusive amulet. THQ Nordic has continued its partnership with IGN for the reveal, providing the site with an exclusive new trailer. You can see a selection of combat there, with the whip and other weapons like a sword and, apparently, flaming nunchucks. Darksiders III was revealed a year ago – here’s what that first look entailed. Darksiders III stars Fury, one of the Four Horsemen of the Apocalypse in the game’s alternate universe. Her fellow Horseman, War, has ushered in the apocalypse, so it’s up to Fury to defeat the Seven Deadly Sins and their many servants in a bid to restore the balance between good and evil. Wielding magic and a whip, Darksiders III promises plenty more hack-and-slash ARPG combat, doubtless propped up by dozens of unlockable abilities, in a Biblical setting.